Linkwitz Lab, 15 Prospect Lane, Corte Madera, CA 94925. E-mail: info@magicLX521.com Web: www.linkwitzlab.com. 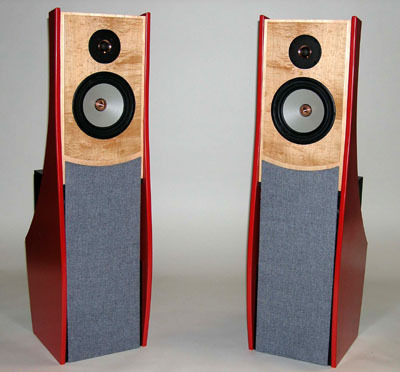 “Orion” loudspeaker system, $5300.00 the pair (custom-built, complete with electronic crossover and cables, but without the required power amplifier and not including S&H). Kit versions available in various stages of completion at lower prices. Tested samples on loan from manufacturer; later samples purchased by The Audio Critic. Advancements in technology can proceed along one of two routes: (1) the improvement of old, standard concepts or (2) the pursuit of new and different concepts. The first is safe and generally productive, but the second can lead to considerably more brilliant results. The Linkwitz Lab “Orion” loudspeaker system clearly falls into the latter category. The dipole approach is not exactly a new concept, but using conventional dynamic drivers that are not enclosed in a box (i.e., open front and back) is still a fairly radical approach. And, yes, the results are brilliant. I’ll go further. I have never listened to a loudspeaker that sounded as musically convincing, in stereo, as the Orion. The soundstage is simply wider, deeper, and more precisely layered—and therefore more lifelike—than I have ever heard out of a pair of transducers. It’s startlingly 3-D sound out of two channels. I feel it is necessary to make that statement before I go into details. The Orion was a totally new kind of audio experience in my life, one that required the reshuffling of established values and assumptions. That said, I must immediately point out the sad fact that this particular speaker, of all speakers, is not available commercially. You can order it as a kit or you can buy a one-off custom-made pair from Linkwitz Lab. Isn’t that typical of today’s audio scene? You can walk into a store and buy just about anything—except the best! The best just isn’t sufficiently commercial. The Orion is an “active” loudspeaker, requiring a multichannel power amplifier driven by an electronic crossover/equalizer. That may be one reason why it isn’t commercial—audiophiles stubbornly resist the inherently superior powered-speaker approach, although in this case the power amplifier is not built in and thus a number of alternative amp choices are possible. In any case, other things being equal, an electronic crossover is preferable to a passive crossover, and direct coupling of the drivers to the amplifier is preferable to coupling through a network. The active (powered) format is simply better, in every way—but who will believe me? Only those who already know. I’ll have a lot more to say about the sound of the Orion, but first let’s look at the design. Each speaker incorporates four drivers. Two 10" woofers—Peerless Xtra Long Stroke (XLS) “subwoofers,” model SWR 269, from Denmark—cover the range from 120 Hz down. They have a fundamental resonance frequency (fS) of 19 Hz, are wired in a push-pull configuration to cancel distortion, and are not baffled—they fire into open air forwards and backwards. The all-important range from 120 Hz to 1.55 kHz is covered by an 8" woofer/midrange—Excel W22EX001 by SEAS, from Norway—which is also mounted completely open, front and back. This driver has an exceptionally stiff and light magnesium cone and a natural rubber surround. Above 1.55 kHz a 1" soft-dome tweeter—Excel T25CF002 “Millennium” by SEAS—covers the range up to about 27 kHz (that’s right! ); it is also open, front and back, but the rear radiation is blocked by the magnet structure. These driver models represent the current state of the art; they were not available until quite recently and are extremely costly. (I understand Linkwitz Lab pays $1200 for the eight drivers in a pair of Orions.) The cabinet housing the four drivers is simplicity itself (see photo), consisting basically of a rigid box with an internal dividing wall but no front and back, topped by an open baffle board. Of course, the dimensions of the cabinet are supercritical, since the exact back-to-front cancellations are part of the fine-tuned acoustical design. It requires a six-channel or eight-channel power amplifier to drive a pair of Orions, six channels if the 10" woofers are paralleled, eight channels if they are driven separately. Not much power per channel is needed for optimum performance; 75 or even just 60 watts into 8 ohms will be sufficient, but twice that power is also safe (and actually needed in the woofer channels with the parallel connection). A crucial part of the design is the dedicated crossover/equalizer that drives the multichannel power amp. It is an elaborate circuit on a single PC board with many op-amps, powered from an outboard ±12V power supply and available either as a kit or fully wired. All connections are through single-ended RCA jacks. The electrical crossover points are at 100 Hz and 1545 Hz; all slopes are 24 dB per octave; and of course each driver except the tweeter is boosted on its bottom end to compensate for the open-baffle acoustic cancellation. (In the case of the woofers that’s a very substantial boost to yield flat response down to the lowest audio frequencies, so you can imagine the excursion capabilities the woofers must have in this kind of design.) A toggle switch on the front panel cuts the low-frequency boost in if there is unwanted subsonic content in the program material. The Orions need to be set up quite differently from box speakers. The more air there is around them the better. They must be placed as far as possible from the back wall and not too near the side walls. Consequently, they are not suitable for all rooms and all decors. That’s the bad news. The good news is that they require no room treatment—the average live room is a perfect match to their dipole launch pattern. Also, they can be listened to at much closer range than typical box speakers. The angle subtended at the listening position by the distance between the speakers can be much larger than the conventional 60° and yield an awesome sonic perspective. More about that below. A dipole speaker like the Orion cannot be measured exactly the same way as a monopole box speaker. For one thing, the usual nearfield measurement of the low-frequency response isn’t valid because it only indicates what the driver (with equalization) is doing without including the acoustic cancellation from the back wave. Moving the microphone further back will include the acoustic cancellation but also allow the room to intrude, so the measurement will no longer be quasi-anechoic. The open-air woofer resonance of 19 Hz is a good indication of the actual bass-response profile, as there is nothing to push the turnover frequency higher. Fig. 1: Frequency response (blue) and phase response (green) at 2 meters on midrange axis. Fig. 2: Frequency response (blue) and phase response (green) at 2 meters, 45 degrees off midrange axis. Fig. 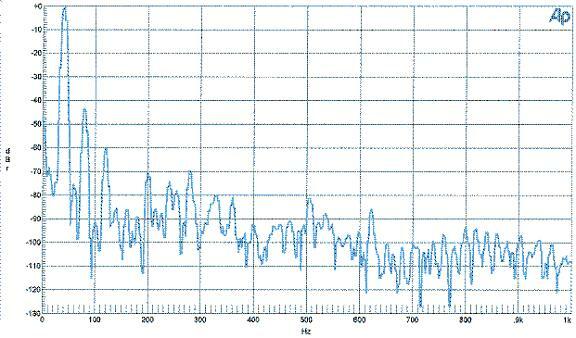 3: Nearfield spectrum of a 40 Hz tone at a 1-meter SPL of 91 dB. So—the Orion is flat (at least in terms of my particular frequency-response curves), wide in dispersion, deep in the bass, low in distortion, and in general picture-perfect according to my admittedly limited measurement techniques. That, however, says very little about the audible qualities of the speaker, which apparently have more to do with the boxless design and the dipole wave launch. Evaluating the sound of the Orions requires the same readjustment of conventional mindsets and assumptions as the measurements. I have already referred to the positioning of the speakers in the room, but that’s just the beginning. The big surprise comes when you first put on a CD, preferably of orchestral music. What’s going on here? The depth of the soundstage has tripled in comparison with high-end box speakers! Everything is more spacious, more solidly defined, more clearly directional, more 3-D. It’s not a small difference. It’s close to a revelation. The orchestra is laid out with crystal clarity behind the speakers, with respect to both left/center/right placement and front/middle/back placement. The simpler and more straightforward the stereo recording, the greater the clarity—messy 20-microphone recordings are less precisely delineated. If the recording is of a single instrument, say an acoustic guitar, the sound is no bigger than it should be, just the correct size within the recorded acoustics, but with a large sound source, such as a full choir, the reproduced sound becomes huge, as if the speakers were eight feet tall and four feet wide. The subjective impression is that the speakers are no longer there; the listener is looking into the soundstage—big or small, as the case may be—without any intermediary. Experimenting with the placement of the Orions yields some unexpected results. The conventional equilateral triangle setup with the listener at one of the apexes is fine; the sonic perspective is excellent that way, as long as the speakers are at some distance from the walls. But listening from much nearer, almost centered between the speakers but not quite, say at a 135° angle, brings the soundstage almost frighteningly alive, especially with a wide sound source such as a symphony orchestra. Needless to say, it would not be practical to have your sofa or armchair that near the speakers on a permanent basis, but it’s a very interesting temporary deployment. As I said, the Orions make you revise your established assumptions and procedures. What about the tonality, the basic audio texture? The lack of coloration or neutrality of the sound, as well as its transparency, will be determined primarily by the quality of the drivers, which in this case is as high as it gets—if better drivers had been available, Siegfried Linkwitz would have chosen those instead. Since the Peerless and SEAS drivers are not exclusive to this design—a few other speaker systems also use them—I cannot say that the Orion is lower in coloration, more neutral, or more transparent than any other speaker. It is certainly equal to the very best out there but no better. Its superiority lies in the structure, rather than the texture, of the reproduced sound. The texture is merely superb but not different; the structure is entirely different from the usual. As for bass response, I find the reproduction of the deepest orchestral and even organ sounds to be fully satisfactory without a subwoofer, but bass freaks may disagree with me. The lowest notes are there, but if you are looking for very high-level playback below 40 Hz or so—maybe for movie soundtracks, etc.—you may want a subwoofer. I don’t. Playing some of my familiar CDs through the Orions produces new insights. Recordings that I did not consider particularly outstanding suddenly sound magnificent. Others that I rated especially high sound nice, with the expected deep soundstage, but nothing more. The speakers, to say it once again at the risk of being repetitious, make you reevaluate all your previous value judgments. Also, the volume at which each recording sounds the most real, the most alive, is much more critical on the Orions than on other speakers. The sound almost seems to click into perfect realism as you hit the right level. One surprise after another. “It is easier for a camel to go through the eye of a needle than for a rich man”…to obtain a pair of Orions—well, maybe not, but certainly easier for him to purchase a pair of Wilson Audio Alexandria X-2’s or Von Schweikert VR-11SE’s for 23 times as much money. They are more readily available but won’t yield equal musical satisfaction because they are still box speakers and don’t benefit from Linkwitz’s special insights. If you just want a set of Orion construction plans and an empty PC board, that’s relatively easy; Linkwitz Lab will ship them to you as soon as you pay for them. If you want precut cabinet panels shipped to you in a flat package, there is a source, and you can also order the eight drivers separately. If you just want to sit back and wait for a finished pair of Orions to arrive at your doorstep, you’ll have to put in a special order and wait a month or more while Linkwitz Lab has them custom-built for you. There are so many different options and so many different prices that it’s easier to refer your to www.linkwitzlab.com than to list them all here. The basic price of a finished pair of Orions with fully wired crossover and all necessary cables, but not including the required six-channel or eight-channel power amplifier, is $5300.00 plus shipping and handling. Considering that it’s arguably the world’s best loudspeaker system, that’s a freaked-out bargain—not even counting all the DIY opportunities to pay a lot less. No, I haven’t tested all the good loudspeakers in the world; I’m just basing my opinion on what I know. My enthusiasm for the Orion knows no bounds. I never had its equal in my listening room; I am totally sold on the “boxless” approach; and I am planning to keep my pair forever. What more can I say? After the above review was written and presumably completed, Siegfried Linkwitz posted a modification of the Orion on his Web site under the title of Revision 0.1. The modification consists of removing the screws that hold the midrange driver to the baffle board and holding the driver by the magnet instead. The magnet is glued with silicone adhesive to a light bracket which is fixed to the top of the open woofer box; the rim of the midrange driver remains in exactly the same position as before but floating, with a very small gap between it and the baffle, which is sealed with a soft foam strip. Thus there are no forces whatsoever transmitted from the rim of the driver to the baffle, and the minuscule “pendulum” effect of the magnet in free suspension on the basket is also stopped. It’s a deader, more completely damped mounting system than before, similar to the mounting system used in Linkwitz’s old, expensive Audio Artistry speakers. Don Barringer, Linkwitz’s associate who researched and developed Revision 0.1, was kind enough to make the changes on my Orions personally, so I know they were done right. The $190.00 conversion kit, available from Linkwitz Lab, is just a bit too tricky for duffers like me to apply without errors. Minimal carpentry skills are necessary. The difference in sound before and after is not dramatic, as you may have guessed by now. Before-and-after listening tests are not as reliable as side-by-side double-blind tests, so I cannot swear to my conclusions, but I believe there is a definite difference. The total acoustic inactivity of the baffle board results in a slightly more neutral, more uncolored, more natural sound on certain instruments and voices. It’s as if the speaker had totally disappeared, leaving no intermediary between the music and the listener. Or so it seems to me. The trouble is that the sound was pretty terrific even before Revision 0.1. If you haven’t heard of Siegfried Linkwitz, at least in the context of the famous Linkwitz-Riley crossover, you haven’t been an audiophile very long. That crossover, however, is the least of his accomplishments. The man is a walking encyclopedia of audio design, one of the most enlightened audio technologists in the world. Go to his Web site, www.linkwitzlab.com, and convince yourself. It is a whole universe of loudspeaker facts, speaker design concepts, and general audio philosophy, with innumerable links and all sorts of entertaining digressions. I haven’t so far found anything remotely comparable to it on the Internet. It’s an evolving book, a labor of love, and—here’s the most important point—you can take every statement in it at face value because it’s science, not tweako subjectivism. 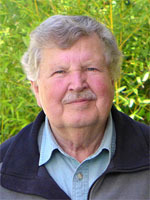 Siegfried Linkwitz was a Hewlett-Packard scientist before he branched out into speaker design, with three and a half decades of electronic instrument designs to his name. Now, in his late sixties, he has an unequaled overview of loudspeaker engineering possibilities, having considered all available options, all transducer types, all “what-about-this-other” alternatives—he makes a special point of this on the Web and in his other writings—and ending up with the Orion design as the best of all possible tradeoffs. He had ample previous design experience with open-back speakers, among them the Audio Artistry “Dvorak,” “Vivaldi,” and “Beethoven” (Audio Artistry is meanwhile out of business), and the more recent Linkwitz Lab “Phoenix,” but he considers the Orion to be the culmination of his engineering efforts. Read all about it on linkwitzlab.com. There is a very interesting and very fundamental issue raised by the persona of Siegfried Linkwitz and his Web site. When a scientifically educated professional talks to him or reads him, his statements will not be disputed because they are supported by incontrovertible science and properly qualified by his reservations or exceptions, if any. On the other hand, when a typical audiophile, let us say a music-loving dentist, reads his statements, his credibility will be called into question with a “maybe it’s so and maybe it isn’t—who knows?”. And then—and this is the point I’m trying to make—when a half-educated, self-appointed audio guru in one of the audiophile journals makes a statement, the typical reader reaction will be the same—maybe it’s so and maybe it isn’t. In other words, to the average audiophile, Siegfried Linkwitz and (let us say) Michael Fremer or Jonathan Scull have the same level of credibility! This is an intolerable situation, a symptom of sickness within the audio community. I have no idea what to do about it but I’m highly sensitized to it because I, too, try to be scientifically incontrovertible, although I’m no Siegfried Linkwitz, not by a long shot. Still, The Audio Critic should have a higher level of credibility than the tweako/weirdo subjectivists, and Siegfried Linkwitz should have absolute credibility, without ifs, ands, or buts. I think this credibility issue is more problematic in audio than in nearly all other disciplines. When people read something in, let us say, Scientific American, they don’t tend to conclude that maybe it’s so and maybe it isn’t. There should be some kind of widely accepted arbiter of authority in consumer audio, but I see none. In professional audio there is the Audio Engineering Society, but the typical audiophile doesn’t even know that it exists. In the case of loudspeakers, especially, qualified and unqualified opinions appear to have equal weight. A sad state of affairs and apparently impossible to remedy.